Not much further on is where the Darling truly begins. Brewarrina is known to the locals simply as ‘Bre’. Brewarrina is ‘must-see’ destination and should be included in any journey through Outback NSW as it provides the visitor with a great insight into the indigenous connection to the land and the river in that it has always been one of the major inter-tribal meeting places within the Murray-Darling Basin. When you reach Brewarrina go down to the banks of the Barwon River and marvel at the ancient Aboriginal rock fish traps. Here is a reminder of the how important Brewarrina was for the local indigenous community. The fish traps known in the Aboriginal language as Ngunnhu, that are purpose built rock structures forming a network of mazes that enabled the corralling and catching of fish. It is understood that the traps sustained several thousand Aboriginal people during tribal gatherings held prior to European settlement. Estimated to have existed for over 40,000 years, the traps are believed to be the oldest man-made structure on earth. The system that exists today is a restoration; much of what existed at the time of European settlement was unfortunately removed in order for the early river boats to travel further upstream. It is said that the fish were so plentiful that there were times when as many as 5000 Aborigines gathered beside the river and amongst the fish traps to enjoy this rich harvest. Bre is still a fabulous fishing spot today but requires the new way of fishing with a line and bait. Set up camp beside the river with all the services close by. Brewarrina was settled by Europeans in the 1840s who, by the 1860s, realised that it was primarily the furthest point that river boats could reliably travel up the Darling River. As such it became an important port for settlers wishing to ship their wool to the coast. Today, Brewarrina is quiet and peaceful with some particularly attractive and historic buildings including Christ Church and the excellent suspension bridge. 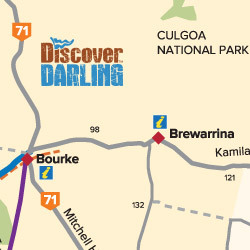 Head further west for another 98km before you reach the magnificent port of Bourke.